Beautiful Princess Mary was all smiles this week as she met with locals in Ethiopia to discuss the importance of women’s rights and gender equality. The 47-year-old embarked on a two day trip with Denmark’s Development Minister Ulla Tørnæs to the African country to witness the development of female leadership. During the first day of the trip Mary sported a lovely green blouse and long white and black skirt for a meeting with staff and patients at a fertility clinic and reproductive health centre in the capital of Addis Abada. 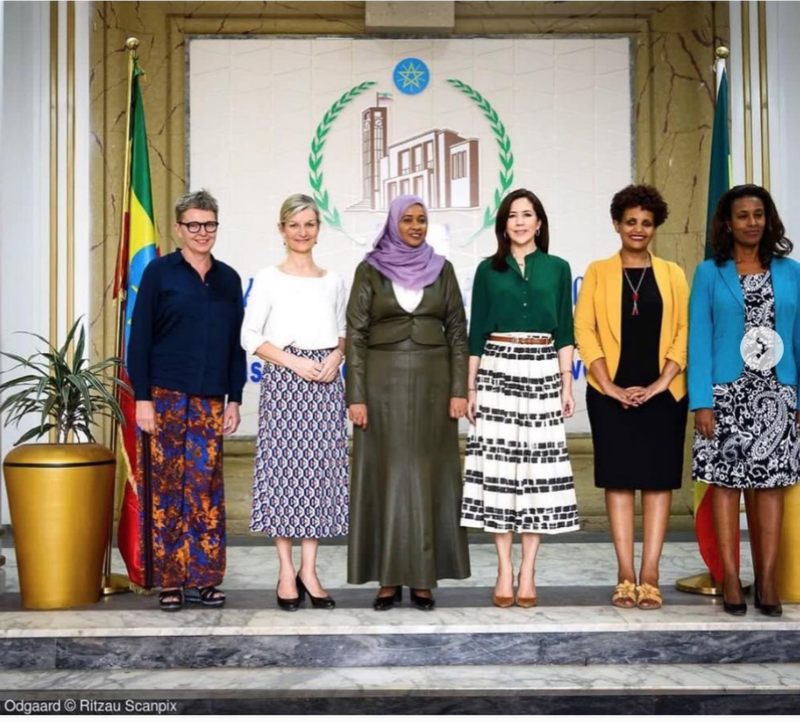 This was followed by a discussion on gender equality in the Ethiopian Parliament where the princess witnessed the rise of women in government. Med fokus på FN’s femte verdensmål om ligestilling mellem kønnene besøger H.K.H. Kronprinsessen i disse dage Etiopien.Besøget begyndte i går i hovedstaden Addis Ababa, hvor Hendes Kongelige Højhed mødte ansatte og patienter på en fertilitetsklinik og et center for reproduktiv sundhed. Begge steder arbejder målrettet med at forbedre piger og kvinders rettigheder. Senere deltog Kronprinsessen i en samtale om ligestillingsdagsordenen i det etiopiske parlament, hvor flere kvinder er placeret på nøgleposter, såsom præsident, højesteretsformand og leder af valgkommissionen. Fans were quick to praise the royal for her dedication to helping others with many taking to social media to express their adoration of Mary. “It gives so much hope that there are people who make a difference for others and for the world and society we live in. Thank you for making a difference,” one person wrote. “Humble and warm-hearted, Crown Princess Mary makes a great effort and difference. She knows how to meet people right where they are,” another commented. It has been a busy month for the Aussie-born princess who completed a tour of Texas just weeks ago. Prior to that the Danish royal also attended a special gala dinner in Texas. Are you a fan of Princess Mary? What do you think of the work she does to help others?